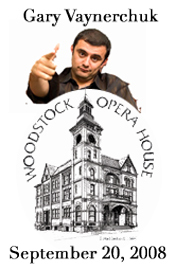 I just wanted to let any Chicago area readers know that tommorow evening Gary Vaynerchuk is going to be in Woodstock, Illinois at the Woodstock Opera House doing “An Evening with Gary Vaynerchuk” which is a benefit for the Creative Living After Dark Series of the Woodstock Fine Arts Association. Gary is a wine expert, author, entrepreneur, host of Wine Library TV, and has appeared on many national television shows. Gary is an amazing personality in the online world and very passionate about people and wine which is completely evident from watching any episode of winelibrary.tv. My friend Frank Gruber of Techcocktail will be emcee’ing the event and I will be there with my wife to show my support. I had the chance to see Gary speak back in may of this year and he truly is an insperation to all no matter what kind of work you are in. If you have nothing going on tommorow evening, Saturday Sept. 20th I recommend you come check the event out for an evening you will never forget. You can purchase tickets online here.